LOS ANGELES, Calif. — Get a Life Childcare Foundation, the only non-profit foundation in the nation dedicated to caring for children whose parents or siblings are living with chronic or terminal illness, will be holding their first annual “Jazz to Support Life” event benefiting the foundation’s second child care facility in West Los Angeles. The evening will feature Wynton Marsalis’ Jazz Piano prodigy, Eric Reed and a silent auction. The event is to be held from 5:30 p.m. – 11 p.m. on Saturday, July 12, 2008 at The Jazz Bakery in Culver City, California. Admission is $30, and limited seating is available. Event sponsors include clothing designer Christian Audigier, Jazz Bakery, RTKL Associates Inc., and Ron Edwards of Air Dreams Designs. The proceeds will be used to furnish “The Get a Life Family Support Center” once construction is completed in late 2008. The new location is intended to support local hospitals, accommodate more children and offer them a wide array of activities and play options such as a computer lab, an art room, and a music center. “We have been so fortunate to gather so much community and corporate support in such a short amount of time for this event. We are so excited to have a talented artist such as Eric Reed grace our event,” said Jade Stanford, Founder and CEO of Get a Life Childcare. Get a Life Childcare Foundation is a non-profit childcare provider focused on creating a safe, nurturing environment for children of chronically or terminally ill parents, while also supporting parents through counseling and other support services. The founder, Jade Stanford, recently was featured on the Emmy(R) award winning PBS series “A Place of Our Own,” which can be viewed on the show website: http://www.aplaceofourown.org/getalife. Jade was also recently awarded a Certificate of Excellence in Childcare by the State Senate of California. 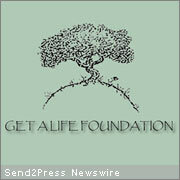 Additional information on Get a Life Childcare Foundation can be found at http://www.getalifechildcare.org.